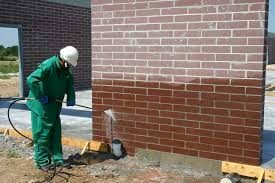 Currently it is recommended to clean new masonry within 14- 28 days from installation for type N mortar and 3-7 days for type S mortar. When cleaning masonry, clean the sample for the job to depict what the final result will be. If no sample exists, it is always a good idea to test an in-discrete area of the wall with the milder cleaner used first to display what the cleaned wall will look like.